I have three amazing polishes to share with you that I received from The Beauty Clutch. The Beauty Clutch offers offer various lines of salon brand name nail polish, spa bath and body products, spa accessories, nail polish, manicure, pedicure, hand and foot care, and beauty accessories to suit your every beauty routine. I have tried a few Morgan Taylor polishes in the past and a couple of them had thick formulas. The polishes I have today have a great formula. They applied wonderfully and dried relatively quickly. Let's move on to the swatches. These swatches are all two coats with a top coat. All Dolled Up - is a gorgeous, vibrant, shimmery pink. I love the bright color in this one. Shop Shop & Roll - is a fantastic shimmery teal green. It has lots of shimmery that add depth and dimension. Super Ultra Violet - is a gorgeous cream polish. I don't think it is violet as much as it is a dusty navy blue. Although it has a tendency toward purple. Morgan Taylor polish is available from The Beauty Clutch for $7.50. Follow The Beauty Clutch on Facebook to keep up with new collections, current releases, restocks and new polishes. They ship to physical addresses and PO Boxes within the Continental United States and US Territories, including Alaska, Hawaii, Puerto Rico and Virgin Islands. Shipping outside the USA is not available. 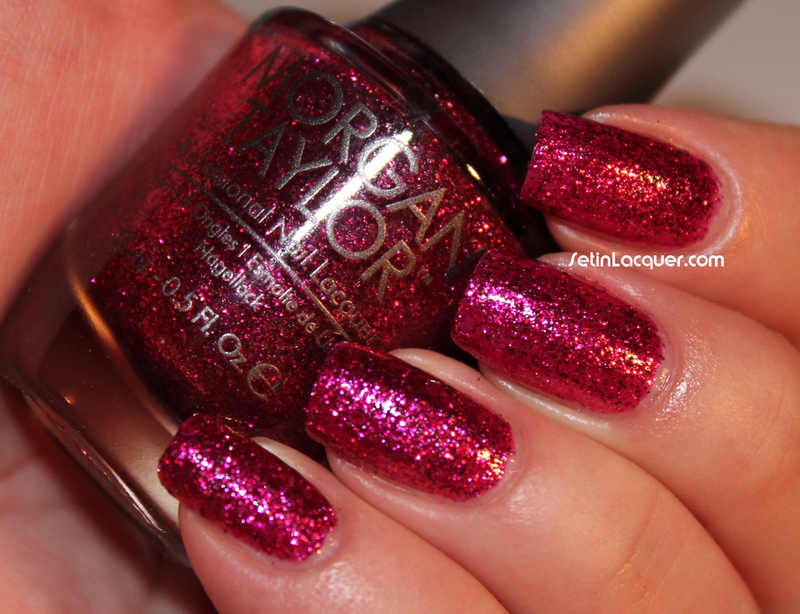 There's a new polish in town - Morgan Taylor Lacquer. A wonderful friend sent me four of these polishes and I am excited to share them with you. "Inspired by luminous pearls, raw gems, semi-precious stones, glimmering silvers and radiant gold all drawn from the earth. The exclusive Morgan Taylor Nail Lacquer is infused with rare and precious elements. In our commitment to the professional and as a worldwide leader in the nail industry we recognize the importance of a globally compliant nail lacquer that is free of Formaldehyde, Toluene, and DBP." Morgan Taylor website. The formulas varied on each polish. Let's jump right in to the swatches. Bright Side - is an eggplant purple. It has a rubbery finish. It did need three coats to even the coverage as it was a bit streaky on the first couple of coats. Jadore My Mani - is a glitter infused wine purple with lots of pink tones. The small glitter swims in a matching base. This is three coats. I probably could have gotten away with two but I wanted complete covereage. 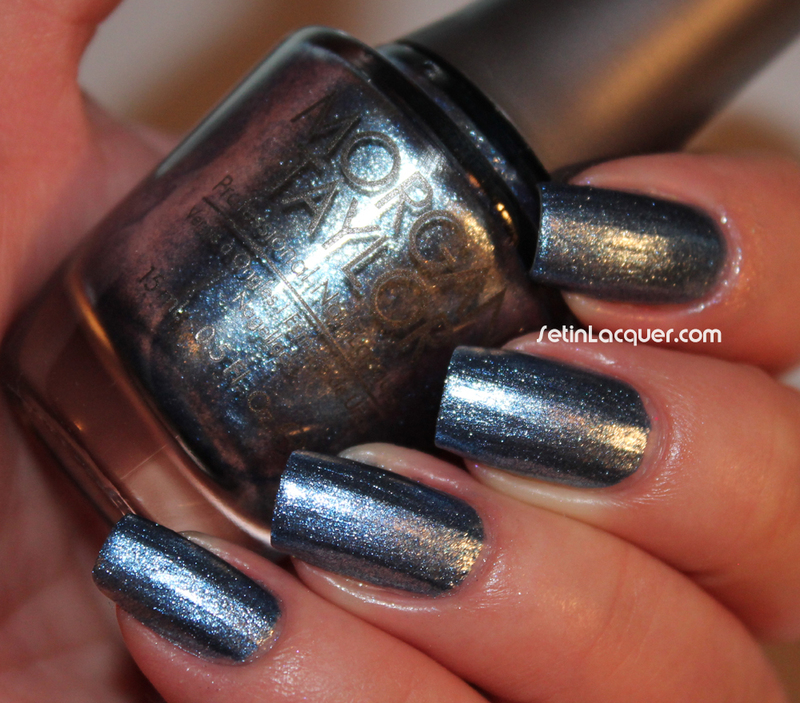 Rhythm and Blues - is a shimmery blue with silver tones to it. It is a metallic polish. It is a little on the thick side but it actually applied well. I love this smoky blue shade. Something to Blog About - is a shimmery deep purple shade with tones of gray. It has a hint of duochrome to it. This is three coats. This shade is amazing and the photos don't quite capture the true spirit of the polish. Morgan Taylor polishes can be purchased at Nail Tech Supply for $4.25. They are also available at CosmoProf for those who have a cosmetology license.